Notes: Potter; from "The Geographical Journal" Vol. XV, No. 5 May 1900, 'A Journey t the Summit of Mount Kenya, British East Africa.' 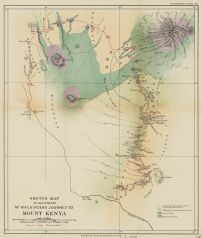 by H. J. Mackinder recording the 1st summit of Mount Kenya on September 13, 1899; scale engraved on map. Associated with the above mentioned Book ID 1758 and other map ID 1744.